Cook the egg noodles in boiling salted water until just tender. Drain, place in a bowl and set aside. Heat a large wok or a heavy-based frying pan until very hot. Add a splash of vegetable oil, then stir-fry the beef slices with the sliced garlic, ginger and chillies until just cooked. Add the shoots or bean sprouts, a good splash of soy sauce and sesame oil and the lime juice for the last 30 seconds of cooking. Tip the contents of the wok into a large bowl, including all the lovely juices. Put the wok back on the heat, add a splash more vegetable oil and all the vegetables. Stir-fry for 1 to 2 minutes, then add the cooked noodles and toss well over the heat. Divide the fried vegetables and noodles between 4 plates. Return the beef and juices to the wok and stir-fry until heated through. Add the coriander and toss until well mixed with the beef. 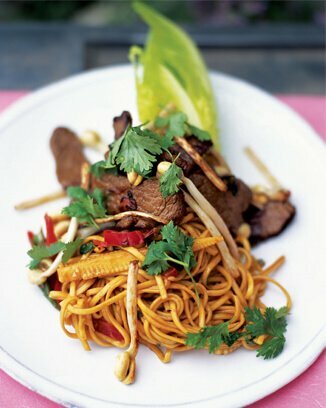 Arrange on top of the noodles and garnish with a cos lettuce leaf.